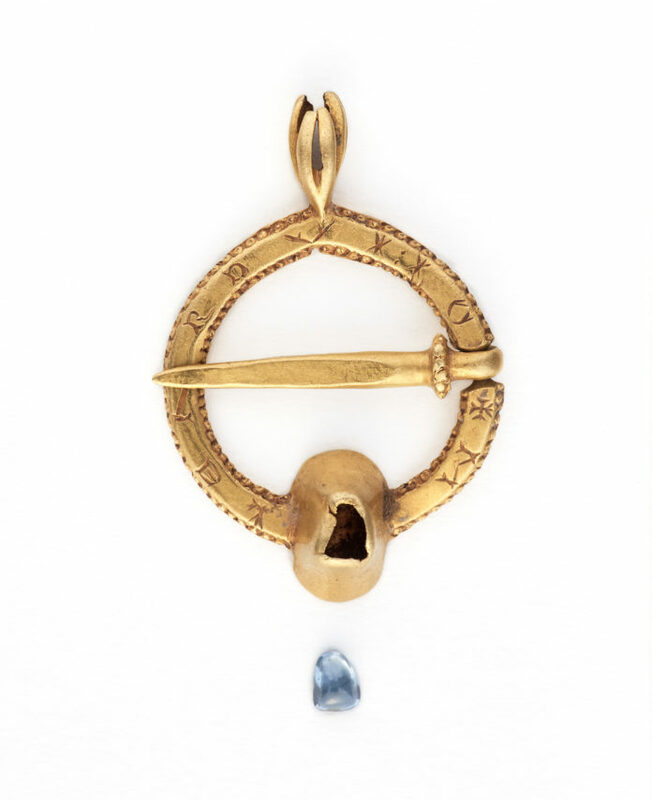 The National Museum of Ireland has announced that a medieval gold ring brooch acquired in 2016 is to be sent on a short-term loan to Músaem Chorca Dhuibhne, Baile an Fheirtéaraigh, close to where it was found. The curator at the museum in Baile an Fheirtéaraigh, Ms Isabel Bennett, was instrumental in reporting the find and the National Museum of Ireland is grateful to her and especially to Mr Ian Andrew, who found the brooch by chance while walking on the beach at Cloosmore, Dingle, Co. Kerry. Worn by both men and women to fasten their cloaks, ring brooches were often given as love tokens or as betrothal gifts during the medieval period. 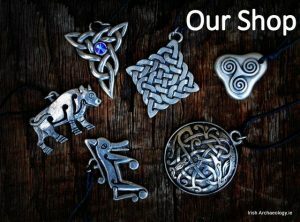 Approximately 150 are known from Ireland, but only a very small number are made from gold. 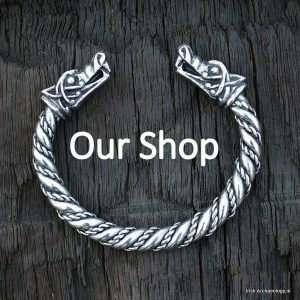 The finder of the Cloosmore brooch, Mr Ian Andrew, was on a holiday visit to the Dingle peninsula, where he has strong family connections. While walking along a rocky coastal foreshore, he noticed a bright light shining between some rocks. After taking a closer look, he identified and retrieved this tiny but exquisite gold ring brooch. He subsequently reported it and was extremely helpful to the National Museum of Ireland in providing every available detail in relation to the find circumstances. The artefact is an example of a rare type of 13th/14th century ring brooch with projecting hands. The piece has a blue stone setting now identified as tourmaline, which is quite similar to sapphire. There is an inscription in Gothic style lettering on the front of the brooch. While most of the letters are legible, their meaning is unclear and they may represent a type of code. The brooch may have had a magical or talismanic association for the wearer. 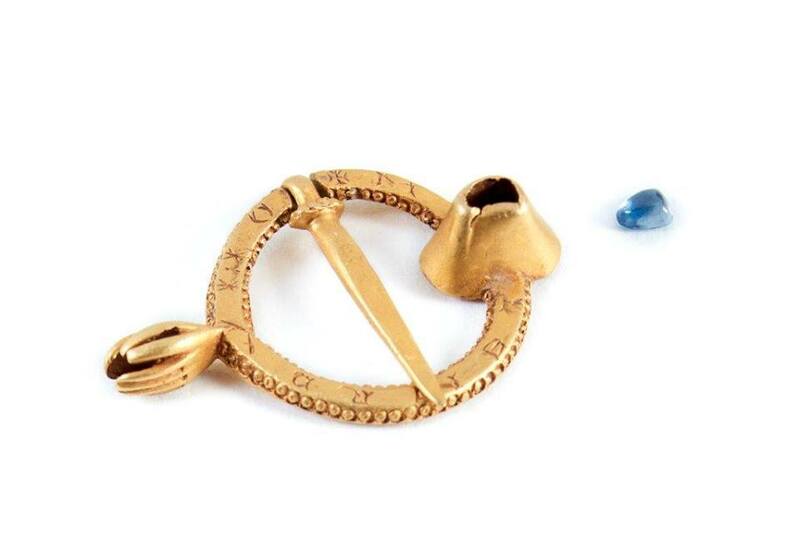 A number of similar pieces are known from Britain, including an nearly identical gold brooch from Kent (see image below and with thanks to Vanessa Oakden for parallel). The Cloosmore ring brooch will be on display in Músaem Chorca Dhuibhne, Baile an Fheirtéaraigh from 10.00 to 17.00 on Friday, 5 October and from 10.00 to 13.00 on Saturday, 6 October 2018. On its return to the National Museum of Ireland, the artefact will be displayed in an exhibition entitled “Dressed to Impress” at the National Museum of Archaeology in Kildare Street, Dublin. Thrilling find! Noting cross & letters, perhaps a code is right: any ideas from 1200-1300 relating to this, though the examples shown are very similar. Glad to know it will be on show where it was found, ‘in the kingdom’!